Sunfire Corporation HRS-8 review | What Hi-Fi? How do you fit a great big sub into your front room without causing upheaval? Buy one that sounds bigger than it looks, obviously – and that's where Sunfire's HRS-8 comes in. 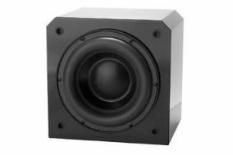 Despite featuring a 20cm driver and a claimed 1000 Watts of amplification, the Sunfire is the smallest sub here – just 25cm cubed, and all of that smoothly finished. It punches well above its size, bringing scale and authority quite at odds with its physical appearance. But, as Scotty said, you cannae rewrite the laws of physics – the Sunfire gets to its limit quicker than we'd like.